Epic dinner tonight, ya’ll! Well the title of this post pretty much sums it all. I found this End Boneless Pork Loin on sale and bought it figuring there was something I could do with it. I searched the Internet and my cookbooks and came up with this concoction. There is a little thing I have about pork. I am so scared of overcooking it. I actually would rather undercook it and then throw it back on the grill/oven/stove if needed. There is almost nothing sadder than overcooked protein. People are SO scared of undercooking that they go the opposite. Have no fear! A cooking thermometer is here! I am still trying to get used to these devices. Digital is best, but just a regular one is fine to. Stick it in at an angle at the thickest part of your meat. I always want to stick it in straight, and that is a mistake. You want to make sure it goes through the entire thick part of the meat, just not straight to the bottom. You will not get a clear reading. So here is my recipe for an amazing dinner. I served with mashed potatoes and peas. So good! I hope you give this recipe a try! 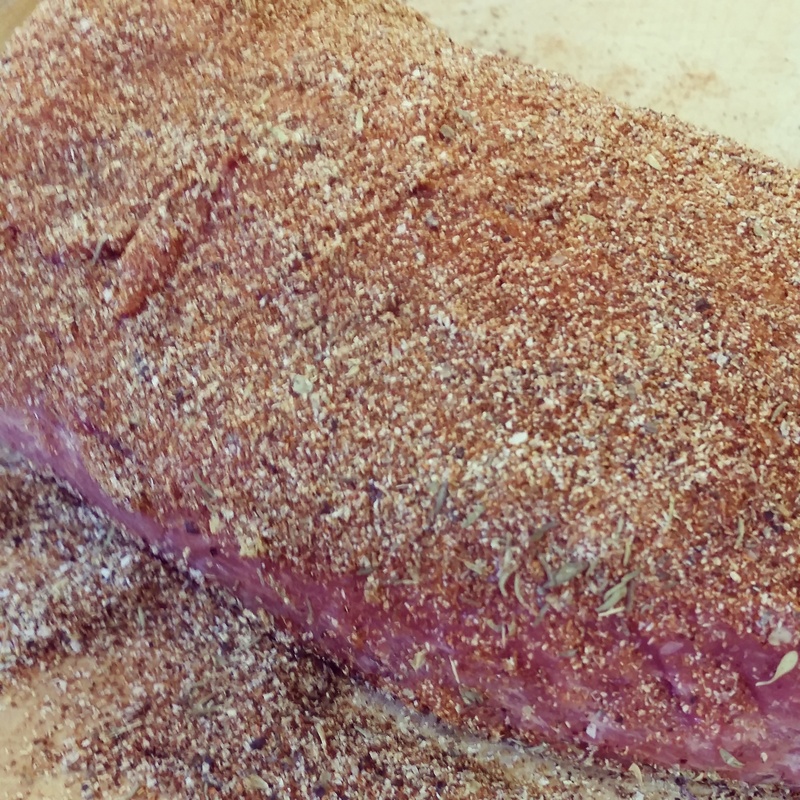 Spice Rub- 1 heaping teaspoon of chili powder, paprika, and cumin- 1/2 teaspoon each dried herb; oregano, thyme, marjoram, etc. use what you have. Add plenty of salt and pepper. Seasoning is a must, this is you chance for all the flavors to seep into the meat. Do not skimp. Spread on your pork. 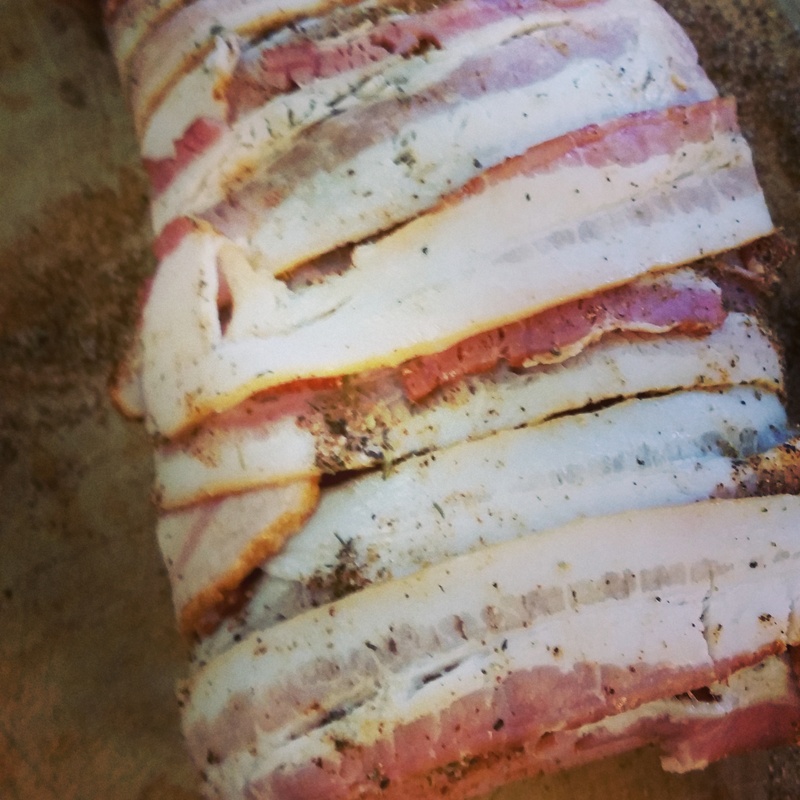 Bacon- enough to cover the pork- I used about 8 pieces. Roast in oven for about 25 minutes or until 115 degrees. Take out and add your glaze. Brown Sugar Glaze- 1/2 cup brown sugar, 1 tablespoon flour, 1 tablespoon apple cider vinegar, 1 tablespoon mustard powder, 1 1/2 tablespoon honey. Use a pastry brush to slather all over your pork. Put back in the oven until it reaches 135. Take out and let rest for 10-15 minutes. Should be about 145-150. Perfection for pork. 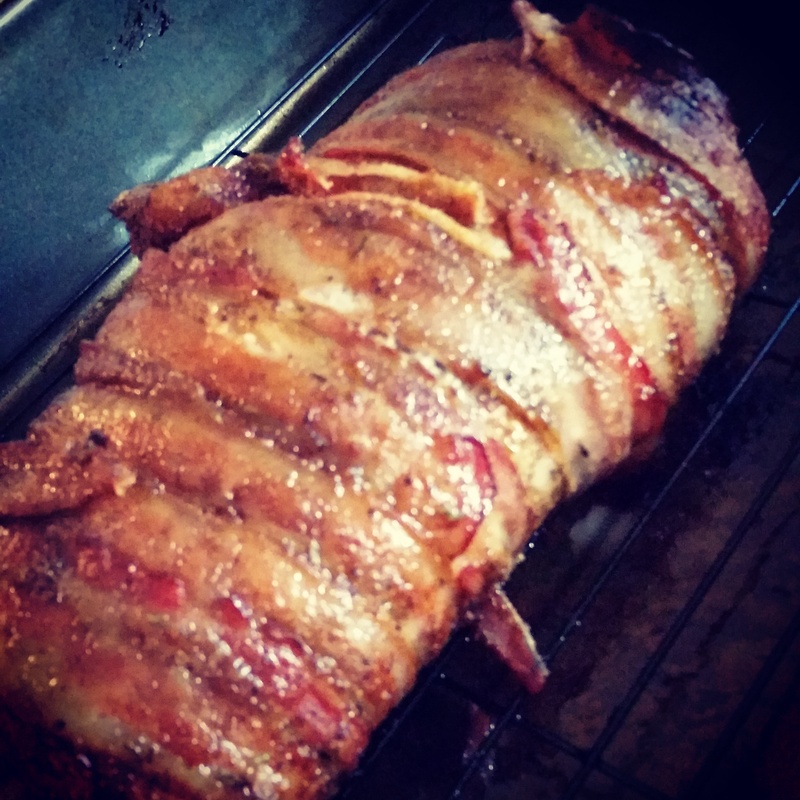 In general, you would cook pork 20-30 per pound of pork. Mine was a smallish boneless loin, so it took about just under an hour.